How does @realDonaldTrump (Donald J. Trump) tweet? Before the President-elect became the president-elect, I didn’t pay much attention to his tweets, but I did know that he seemed to have a unique style of writing them. To me, it felt like he tweeted like he spoke in public. But what was that tone or Trump brand? From a quick glance of his account, the usage of exclamation points seemed prominent. I wondered if that was consistent, and I wondered what else I could find. So I ran an analysis Trump’s tweets as well as @HillaryClinton, @CNN and @FoxNews’ for some comparison. Compare the individual users’ accounts with “objective” news sources’ Twitter accounts. Since source objectivity is always a topic of hot debate (or a hot topic of debate), I took @CNN and @FoxNews. 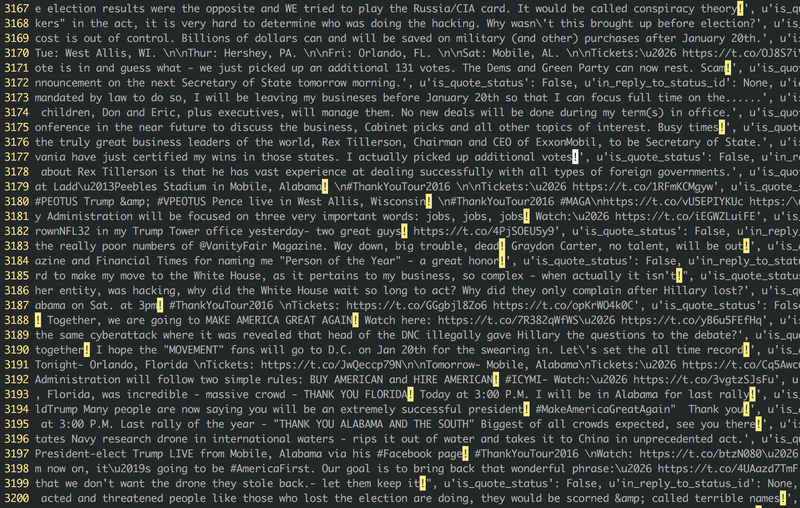 Pull as many of Trump’s Tweets as I could via Twitter API. The best service to perform this operation is /user_timeline. You can only get the last 3,200 tweets from any particular user handle, which is unfortunate because plenty of accounts have authored far more than 3,200 tweets (e.g. Trump has written over 30,000 tweets). Take the tweets and do some Natural Language Processing with Python’s NLTK. Classify the reading level or difficulty of each word. Determine the reading level of the account. I didn’t implement this. I started, but then I got distracted. Pull out an aggregate view of some other interesting tweet data, like #HASHTAG usage. If you’ve seen Trump speak, you probably may have noticed his strong intonations and general emphatic demeanor. His tweets seem to capture this partially through punctuation alone. His words are sprinkled with the strongest punctuation mark in the English language, the exclamation mark. “!” occurs 2336 times over 3200 Trump tweets. And “!” occurs at least once 1954 times over 3200 Trump tweets. Which means that 61% of Trump’s tweets contain an exclamation mark (based on my 3200 tweet dataset). This seemed astonishingly high; when I first pulled this I thought my code was incorrect. So I opened my file of tweets and eyeballed it to confirm. I figured if 60+ % of tweets contained an exclamation mark, then it would be easy to confirm my sanity (or lack thereof) from the text file. Which was Retweeted 27,158 times and Favorited 61,084 times. Created on August 20, 2016. Trump’s top twenty favorite adjectives are listed below, along with the top 20 adjectives from the comparison group. It’s not really a surprise that “great” was number one for Trump because, among other things, his campaign’s slogan was “Make America Great Again.” Notably, I removed stopwords and only grabbed lowercase words to help filter out some noise from the data. Relative frequency is the percentage relative to the other adjectives in the dataset. Below is the list of top 20 adjectives from @realDonaldTrump, @HillaryClinton, @CNN, @FoxNews from their last 3200 tweets. To calculate the sentiment of the tweets, I used a function in the nltk library called demo_liu_hu_lexicon() which classifies each word of the sentence as Positive, Negative, or Neutral, and then does a basic count of each word-classification category. Whichever group has the highest count is how the text will get assigned. There are definitely better ways to do this. I considered an integration with IBM’s Watson, but time was doing its thing, being time, and being of the essence and such. This section contains a top 5 hashtag summary table for the entire analysis group, and also has the top 20 hashtags for each account listed afterward. You can infer what you will from this data. 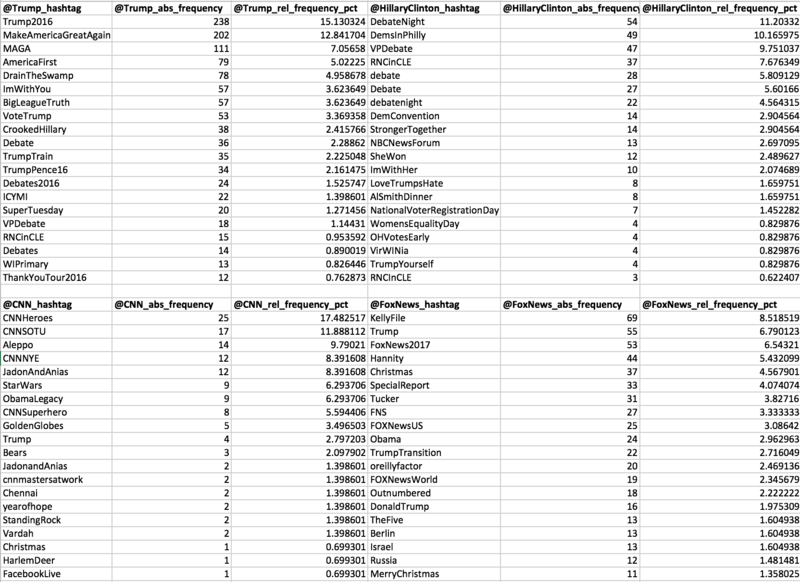 I did find it interesting that the top-used hashtag by Trump was one of self-promotion, and Hillary Clinton used a lot of hashtags relating to the debates. Just looking at the hashtag data makes me think that Trump’s social media strategy was much stronger throughout the campaign. In addition, all four Twitter accounts had at least one hashtag with “Trump” in it. From a marketing perspective, that’s good brand awareness. Below are the top hashtags for the entire group. If you would like to access some of the code/data, it is publicly available on my GitHub repo. I’ve also included all four files that contain all of the tweets on which I ran the analysis in the data/ directory.